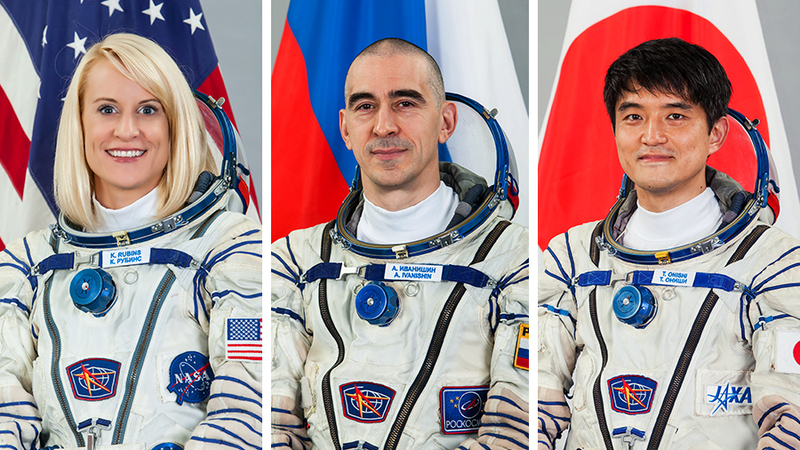 (From left) Expedition 48-49 crew members Kate Rubins, Anatoly Ivanishin and Takuya Onishi pose for individual crew portraits. Following 34 orbits around the Earth aboard their upgraded Soyuz spacecraft, NASA astronaut Kate Rubins, cosmonaut Anatoly Ivanishin of Roscosmos, and astronaut Takuya Onishi of the Japan Aerospace Exploration Agency (JAXA) are scheduled to dock to the International Space Station at 12:12 a.m. EDT Saturday, July 9. NASA Television coverage of docking to the Rassvet module will begin at 11:30 p.m. tonight. Watch live at https://www.nasa.gov/nasatv. The three crew members launched aboard a Soyuz MS-01 from the Baikonur Cosmodrome in Kazakhstan at 9:36 p.m. EDT Wednesday (7:36 a.m. Baikonur time, July 7). I am an 83 year old Brit!!!!!!! NASA never fails to amaze me. Thank you very much.